Delicate floral images create lovely focal points or backgrounds. Oooh, it is such a lovely stamp set. The card examples are great, aren’t they? I never think to stamp a line image and not colour it!! That is something I might have to try…in the future. The Lovely Lattice is a Level 1 item which means it could be yours for FREE with a qualifying order of $90. Sale-A-Bration ends on March 31, 2019, so there is still plenty of time to take advantage of this fantastic promotion. 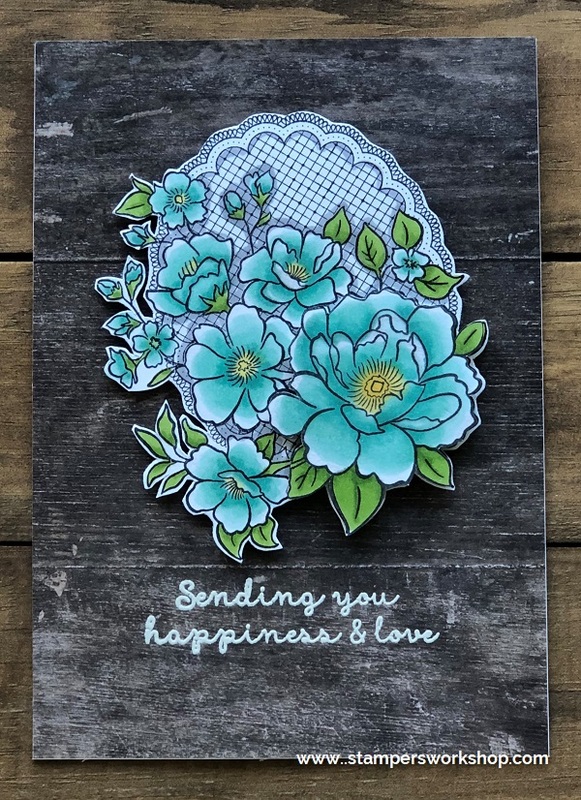 Hi everyone, today I am showing you another way to use the Lovely Lattice Stamp and the card is inspired by one I made back in August 2018 which you can see here. Often times we think we need to use the stamp exactly as it has been designed – and why wouldn’t we? They always look fantastic. However, if we look at our stamps a little differently we extend the life of them and the results can be pretty fabulous! 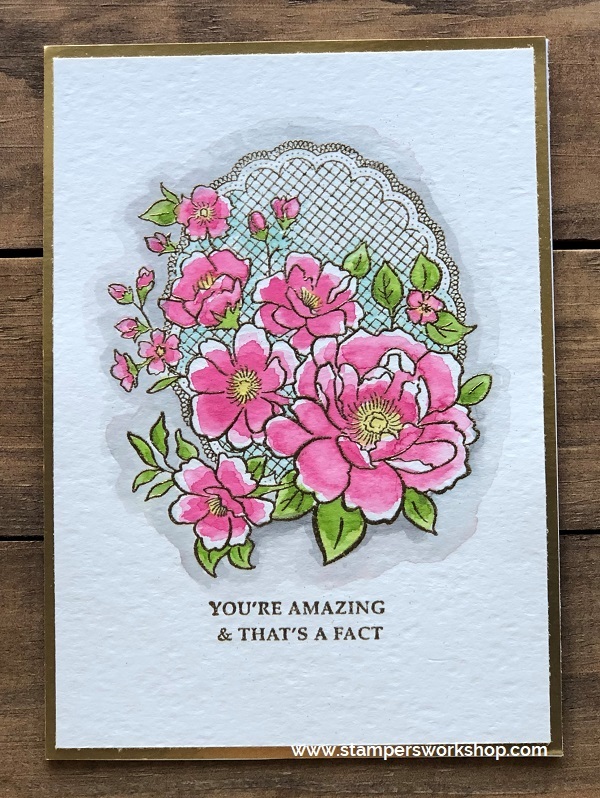 For the card below, I used the main floral design however I tried to ink up the flowers only. I then stamped the image all over my panel. Using my Stampin’ Blends, I coloured the image. 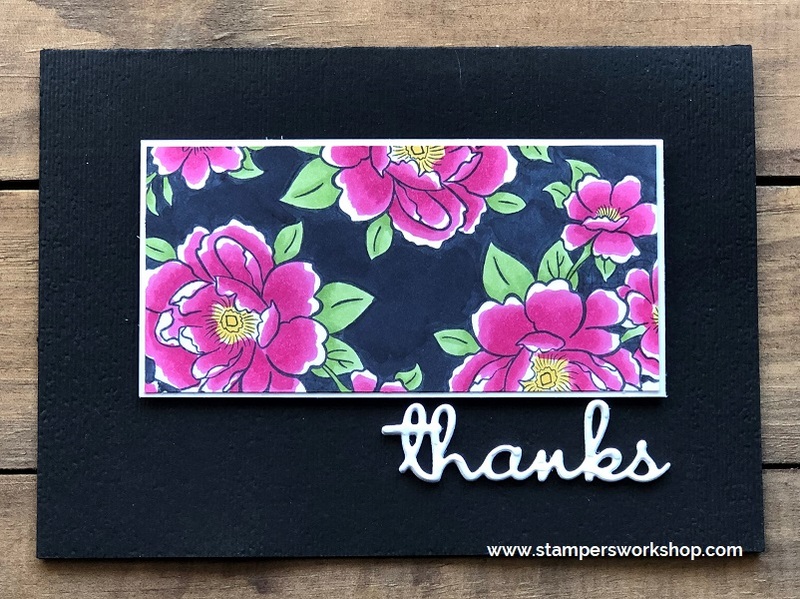 The Basic Black Dark Stampin’ Blends Marker removed any signs of the lattice part of the stamped image as I coloured in the background. If you didn’t know any better you’d think the flowers were individual stamps, or maybe a background image, don’t you think? I love this technique. I think it looks so effective! 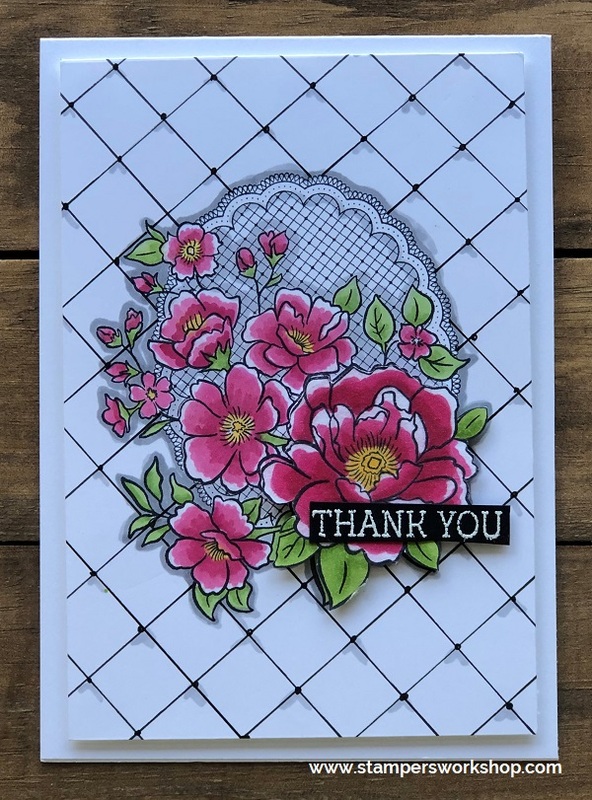 Hi everyone, just when you thought I had moved on from using the Lovely Lattice stamp set I’m back with another card using this sweet stamp set. It’s a definite favourite of mine! I also really wanted to show you all one of the beautiful ribbons from the Occasions Catalogue release. 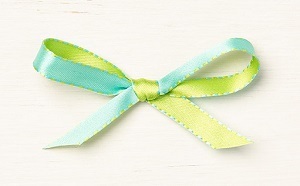 It is the Coastal Cabana/Granny Apple Green 3/8″ (1 Cm) Reversible Ribbon. I think it is gorgeous and I had to use it on today’s card. 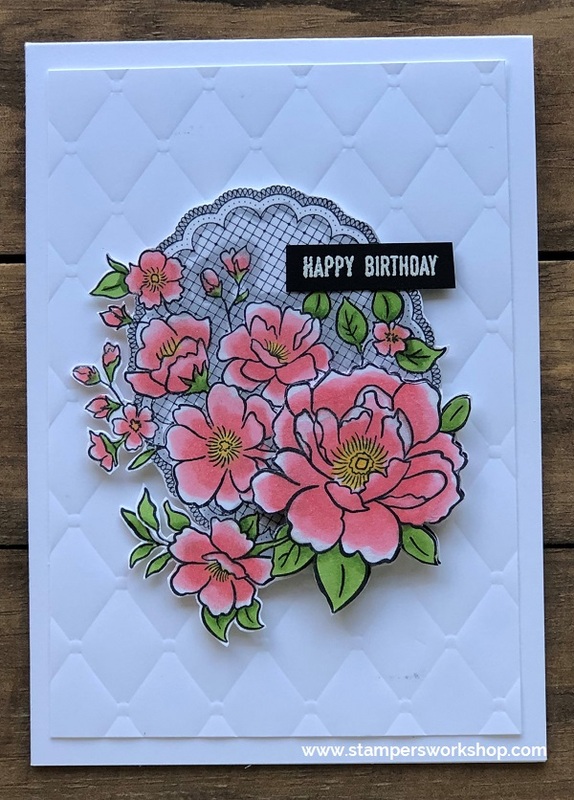 The floral image was coloured with Stampin’ Blends and I stamped, coloured and trimmed the largest flower and popped it up for some extra dimension. I finished off the card with the gorgeous ribbon. I thought it looked so pretty! This Coastal Cabana/Granny Apple Green 3/8″ (1cm) Reversible Ribbon is an easy way to add style to your projects. Tie it, loop it, wrap it, cut it. We have the styles you love in the colours you want. It’s so pretty, isn’t it! Hi everyone, for the most part when I am colouring I reach for my Stampin’ Blends. I do, however, also love to watercolour. 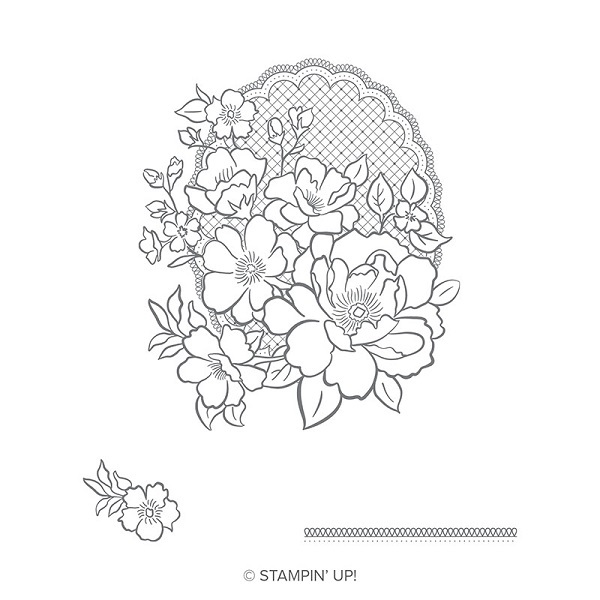 I thought the floral image in the Lovely Lattice Stamp set would be perfect to watercolour. My favourite method for watercolouring is to scribble a Stampin’ Write marker on an acrylic block, add some water and pick up the colour with my Aqua Painter. If using proper watercolour paper I will often pre-wet the paper before adding colour so that the colour moves freely. For the card I am sharing today I first heat embossed the image and sentiment (from the Strong & Beautiful stamp set) with Gold Stampin’ Emboss Powder – doesn’t it look gorgeous?! It creates such an elegant look. I then added colour as described above. Once finished I added the panel to a panel of Gold Foil which was adhered to a card base. I think it looks so pretty! It was so quick and easy to do! I hope you’ll give watercolouring (not to mention gold-embossing) a try! 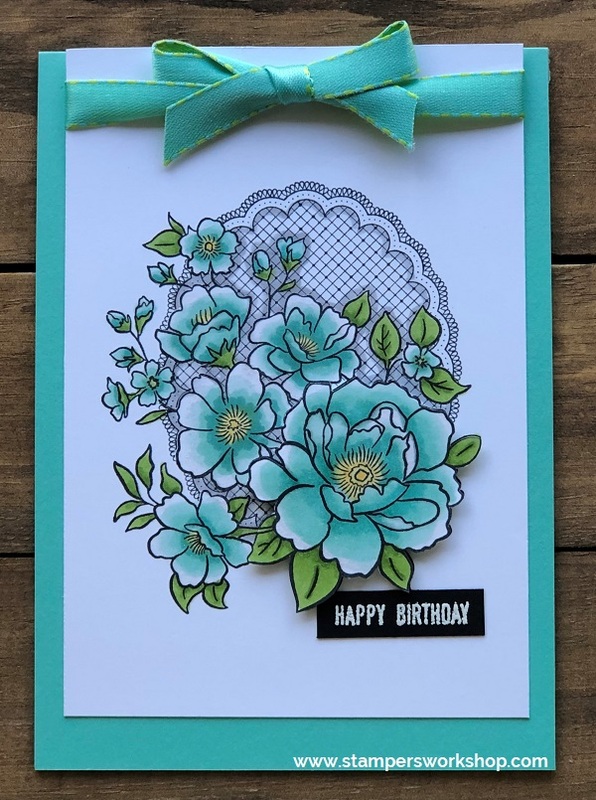 Hi everyone, if you liked the look of the card I shared using the Lovely Lattice stamp set a few days ago but the idea of ruling the lines didn’t appeal, you might prefer the card I am sharing today. Instead of drawing lines using the Journaling Pens, I used the Tufted Dynamic Textured Impressions Embossing Folder to create the background. 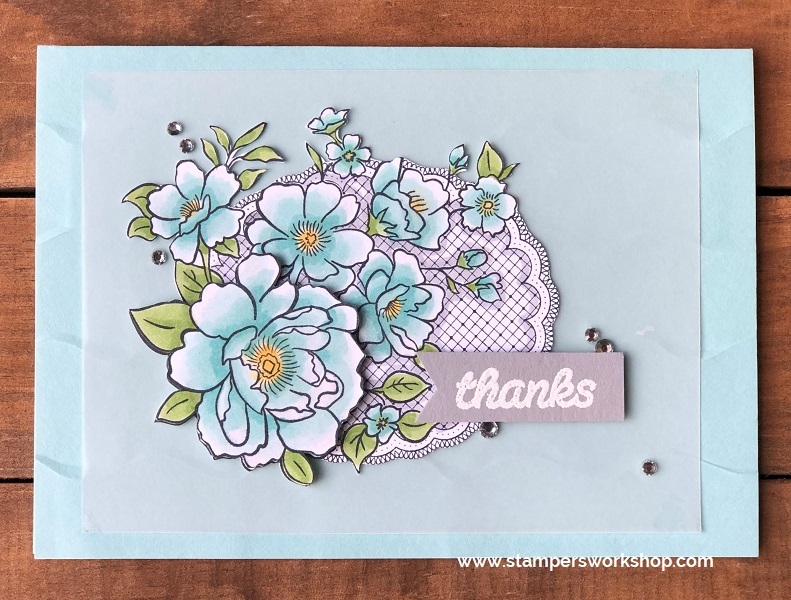 The image was coloured with Stampin’ Blends, but you could use your preferred colouring medium. I trimmed out the coloured image before popping it up on the background. Using an embossing folder is a quick and easy way to add dimension to your card project…and they look great! Hi everyone, one of my favourite rewards from the new Sale-A-Bration catalogue is the Lovely Lattice stamp set. I love to colour so I thought this stamp set would be a perfect choice for my freebie when I placed my latest order. 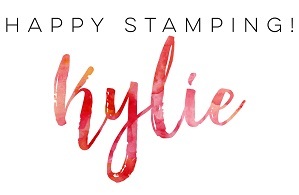 I used my Stampin’ Blends to colour the image however you could use your medium of choice. It popped into my mind the stamped image might look quite effective when part of a “quilted” look. I used the journaling pens to create my background then added a little shadowing in the corners to create some depth. Journaling pens are fantastic as they really allow you to personalise your card designs. I’m so happy with how it turned out. I hope you’ll give this a try too. If you do, I’d love to see your creations.